provides free surgical treatment for patients in developing countries that have little or no access to life-improving care for arthritis or other debilitating bone and joint conditions. Operation Walk Virginia also educates in-country orthopedic surgeons, nurses, physical therapists and other healthcare professionals on the most advanced treatments and surgical techniques for diseases of the hip and knee joints. This is done in conjunction with surgeries to help create a lasting contribution to patient care in developing countries. Imagine living your life with the severe pain of crippling arthritis and looking at a future that holds no hope of relief, because there is no access to quality health care and no money to pay for joint replacement surgery. Imagine the despair of feeling that you cannot provide for your loved ones due to the never ending pain associated with trying simply to walk. We invite you to join us in our mission as we prepare for the next Operation Walk Virginia trip. 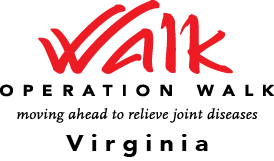 Our Operation Walk Virginia team will again travel on upcoming missions in other 3rd world and developing countries. The cost of one Operation Walk Virginia trip is approx.$150K which includes medical supplies, medications, patient equipment, and airfare, ground travel, meals and hotel accommodations for the volunteer medical team. Our volunteer medical team consists of physicians, nurses, physical therapists and medical technicians who, in partnership with the Inova Joint Replacement Center, volunteer their time and skills to help others. We are planning to perform joint replacement surgery on up to 60 patients in the space of one week during each of the upcoming trips. We seek your support in helping these people to literally get back on their feet. We are a 501(c)3 organization your donation is tax deductible. Make a difference to someone less fortunate, donate today! If you are a medical professional, volunteer to help out on an upcoming mission. Become a valued team member and sponsor one of our missions. Contact us about donating surgical and orthopedic equipment for an upcoming mission. Keep informed. sign-up on our newsletter and emails.